Today, Nicollet Avenue; tomorrow, Broadway. Thursday to Saturday, Feb. 18 to 20, the Minnesota Orchestra, led by Osmo Vänskä, perform Jean Sibelius’s Symphony No. 1 and Symphony No. 3, as well as Sibelius’s Violin Concerto (for which the orchestra will be joined by guest soloist Hilary Hahn). Classical MPR will broadcast Friday’s live concert, starting at 8 p.m. The weekend’s concerts at Orchestra Hall in Minneapolis are a preview of the same concert the Minnesota Orchestra and Hahn will perform at Carnegie Hall in New York on March 3. As this video suggests, listeners in Minnesota are in for a treat this weekend … as New Yorkers will be on March 3. No tuxedos, formal gowns or bouquets of flowers — this video is an unfettered look at musicians hard at work. Ahead of its New Year’s Day concert featuring Beethoven’s Ninth Symphony, the Minnesota Orchestra released this video of Osmo Vänskä leading a Dec. 31 rehearsal. Watch the intense movements of conductor and musicians as they practice the first movement of Beethoven’s Ninth. It’s a sneak preview of the Minnesota Orchestra’s concert that takes place Friday, Jan. 1, 2016, at Orchestra Hall in Minneapolis. Classical MPR will broadcast this live concert; Brian Newhouse hosts. The eyes of much of the world were on Cuba as the Minnesota Orchestra performed two historic concerts in Havana. In addition to playing the spotlight concerts, orchestra musicians — including Music Director Osmo Vänskä — ventured out to perform Cuban music in a smaller venue. MPR photographer Nate Ryan’s images from Cuba are truly captivating, but Nate explains he was not alone in covering the Minnesota Orhcestra’s historic visit to the island nation. In and around the musical activities in Havana, Nate saw teams from Al-Jazeera America, from BBC World (which produced this video) and from Chinese media. As one might expect, Nate also met a photographer from Helsingin Sanomat, the biggest newspaper in Osmo Vänskä’s native Finland. As expected, music director of the Minnesota Orchestra Osmo Vänskä played jazz in a nightclub on Saturday night in Havana. The first visit of a U.S. orchestra in this century ended up in the Habana Café nightclub, where the orchestra players who are skilled in jazz jammed with the traditional Cuban ensemble, Orquesta Aragón. Before his conducting career, Vänskä was first-chair clarinet in both the Turku and Helsinki orchestras. On this evening in at the Habana Café, Vänskä plays clarinet on many of the numbers [watch video here]. The audience consisted mostly of people from the Minnesota Orchestra or from the U.S. delegation; Habana Café is too expensive for local Cubans. On the other hand, the Minnesota Orchestra concert tickets were affordable to Cubans, who filled the Teatro Nacional twice. The audience, saturated as they are with the Castro brothers’ socialist rhetoric, weren’t bothered by the U.S. national anthem when the orchestra played it alongside the Cuban national anthem on Saturday. The Saturday-night concert was not quite as good as the previous night’s supernatural Beethoven concert. The Minnesotans sought to achieve Cuban rhythms in the Alejandro Garcia Caturian danzón, and in the Bernstein, they achieved the evocations of the musica, West Side Story. The playing was very good, but not quite exceptional. In bits and pieces of Prokofiev’s Romeo and Juliet ballet music, we heard many bulls-eyes. And matching the Latin rhythms, Vänskä concluded both nights with the Säkkijärven polka. The Cuban audience was spellbound. 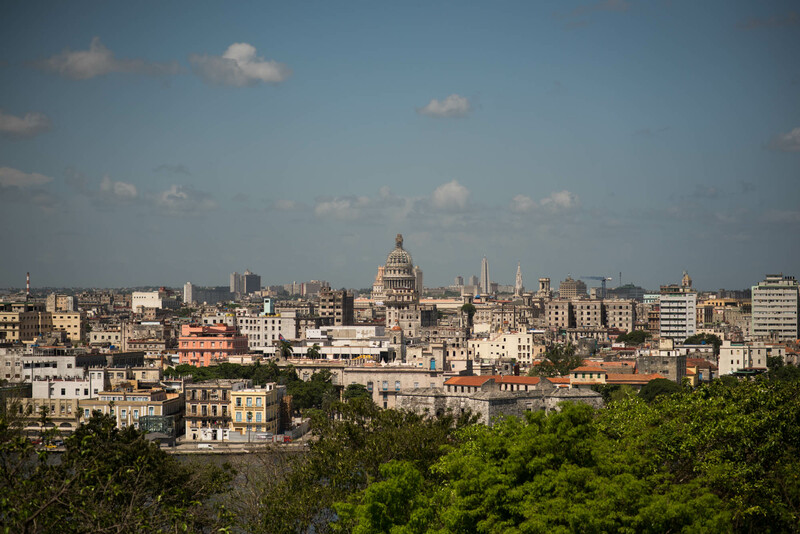 MPR’s Nate Ryan was also at the Habana Café nightclub, where he captured the photos below.